Acknowledged author wrote ISSUES IN ECONOMICS TODAY 8 comprising 560 pages back in 2016. Textbook and etextbook are published under ISBN 1259746399 and 9781259746390. 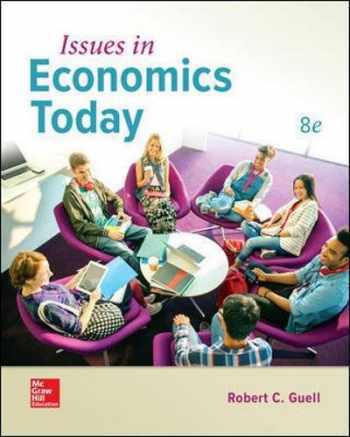 Since then ISSUES IN ECONOMICS TODAY 8 textbook received total rating of 3.5 stars and was available to sell back to BooksRun online for the top buyback price of $30.67 or rent at the marketplace. Guell's Issues in Economics Today presents economic theory brought to life through current issues with an engaging, conversational style. The 8th edition includes 8 theory chapters introducing the core topics in microeconomics and macroeconomics, and a selection of 40 short issues chapters, from which instructors can pick and choose the issues of most interest to their students. This format allows maximum flexibility for instructors to lay a foundation of theory first or dive right into coverage of today's current issues. In addition, issues can be organized along themes such as social policy, health and education policy, election year issues, international issues, and business issues, or combined with outside content. Guell's 8th edition provides content that is timely and relevant for students, flexible enough to fit any course design.